On September 13, the Mint of Austria announced a new series of coins that will feature not only a new denomination but some of the most beloved, admired, and—in some cases—feared animals known to many of us either through interaction or by reputation. The new series, “Colorful Creatures,” will highlight a variety of both nocturnal and otherwise-elusive animals that can be found on almost every inhabited continent. The series will consist of 12 coins, with one issued each quarter over a three-year period. The first coin will be released next month, followed by four per year in 2017 and 2018 and the final three in 2019. 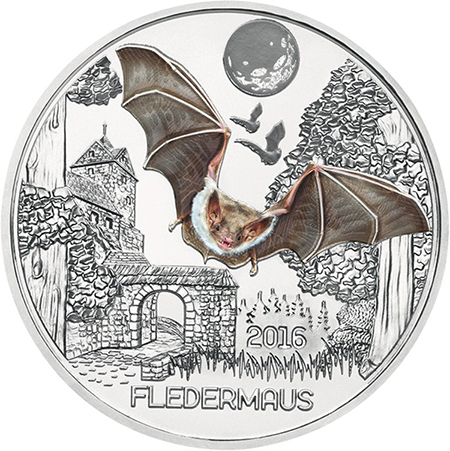 The first coin will feature the common bat (or fledermaus in German). Of particular interest with this series is the addition of a “glow-in-the-dark” application that will further feature the color design depicted on the obverse side. The base-metal series is aimed at a younger collector, but the Austrian Mint expects animal lovers to of all ages to gravitate to this series. The obverse design depicts the bat in mid-flight, with a full moon in the background along with the ruins of a castle and archway—the perfect setting and habitat for this nocturnal, airborne mammal. The year of issue, 2016, appears next to the archway, and the species, FLEDERMAUS, below. The design was created by Austria Mint chief engraver Helmut Andexlinger, who has designed many coins for the mint and has been its chief engraver since earlier this year. 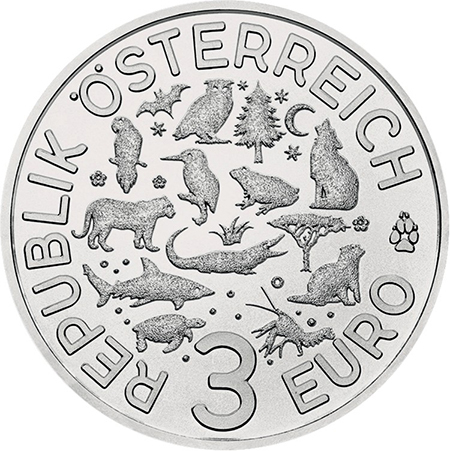 The reverse incorporates all 12 animals that will be included in this series, encircled by the legend REPUBLIK ÖSTERREICH and denomination 3 EURO. The series will be available October 5 and is offered without presentation packaging. 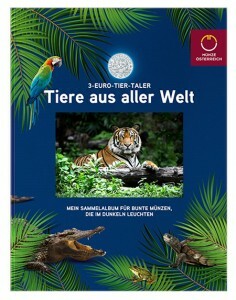 A special album (shown below) for all 12 coins in the series is available from the Austria Mint. For more information on this and other coins offered by the Austrian Mint, please visit their website. International orders dispatched where applicable.